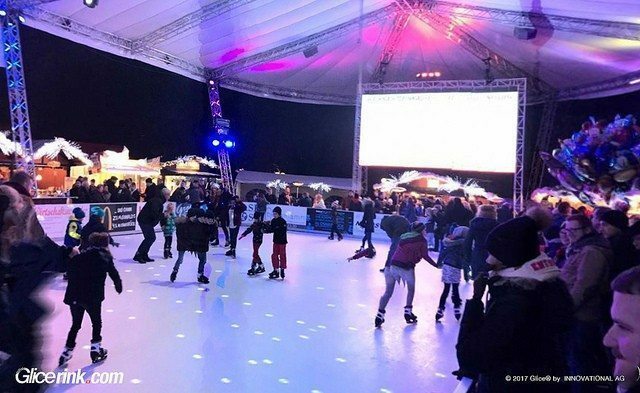 The winter season in Osnabrück, Germany took an unexpected turn this year, when a Glice® synthetic ice rink was installed in the heart of the city. The concept of Eiszauber was born when a group of local showmen came across Glice® synthetic ice rinks and saw the potential of the innovative and eco-friendly design. Due to space limitations and the immense electricity costs involved, a traditional ice rink wouldn’t be feasible on Osnabrück’s Ledenhof square. The “green” technology of Glice® ice rinks, however, made it easy to find investors and convince the city council of the idea. Thanks to the simplicity of Glice® Eiszauber could be installed within merely 16 days. The 12x24m ice rink was inaugurated by the major and redefined winter fun for the citizens, who ice-skated for free.